The former Kelley Greens at Nahant, a public, nine-hole golf course, is under new management and will reopen in April. The clubhouse is being transformed into a fine-dining facility with a bar, lounge, and updated function space, while capital improvements are planned for the golf course. What was once a dark, tired-looking space is being transformed into a clubhouse with dining and function space that will serve as the base of operations for Nahant (Mass.) Golf Club, the Lynn, Mass., Item Live reported. PGA professional Toby Ahern, restaurateur John Moore and longtime Golf Course Superintendents Association of America member Anthony De Dominicis are pleased with how quickly Wilson Brothers Construction is rehabbing the former home of Kelley Greens at Nahant, Live reported. Moore and De Dominicis are partners in Play it as it Lies Golf Management Inc., chosen by the town to manage its nine-hole public golf course. For the past decade, the property has been managed by Michael O’Callaghan, but his lease expired on December 31. The new managers were on site on New Year’s Day, ready to start ambitious improvements. Their deal with the town is for five years, with the opportunity to go to 15. The managers declined to say how much they are investing in the project, Live reported. “It is ongoing; we don’t have a final figure yet, but it is more than anyone has ever invested here,” said De Dominicis, who lives in town. An April opening is planned, Live reported. “[Town administrator] Jeff Chelgren and the town have been fantastic, very supportive and encouraging, very forward-thinking by extending the potential length of the lease,” said De Dominicis. A second entrance will lead directly to the 42-seat Season’s restaurant. The bar area will be upgraded and will feature 20 high-top tables and 22 seats at the bar. The Keno and lottery machines will not be returning, Moore said. The pro shop will also be updated, Live reported. “Everything will be new,” said Moore. The club plans to install two wells and modernize the irrigation system, so the course could be self-sufficient for water, Live reported. Ahern plans to beef up the golf programs for juniors and women in addition to assisting the many leagues that play the par-30 course regularly. 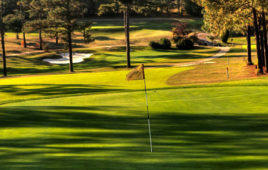 “Given people’s lifestyles today, where time is so valuable, the nine holes we offer is a more realistic option. People won’t have to spend six hours on the course, about one hour and 45 minutes for nine holes on Saturday will be the norm,” said Ahern.